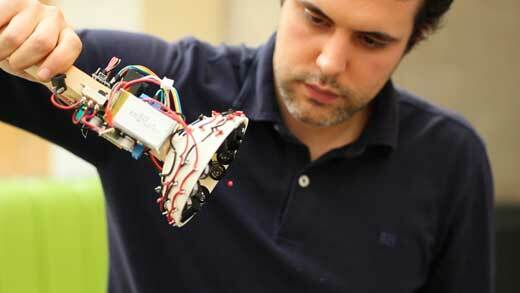 (Nanowerk News) Last year Asier Marzo, then a doctoral student at the Public University of Navarre, helped develop the first single-sided acoustic tractor beam -- that is, the first realization of trapping and pulling an object using sound waves from only one direction. Now a research assistant at the University of Bristol, Marzo has lead a team that adapted the technology to be, for all intents and purposes, 3-D printable by anyone (with some assembly required, of course). In addition to a fully detailed how-to video that the group produced for the public, the results of the work developing this do-it-yourself, handheld acoustic tractor beam will appear this week as an open access paper in Applied Physics Letters ("Realization of compact tractor beams using acoustic delay-lines"). "There will be a set of instructions with a list of the needed components and a step-by-step video. The components are very simple, like an Arduino and a motor driver, and everything can be bought on Amazon for less than ?50 (about $70)," Marzo said.